Searching for a home within the Sunrise Elementary School Zone? Then you are in the right place! We work hard to make your next home search easy and efficient, so that when you are ready to buy or sell, we are ready to help! 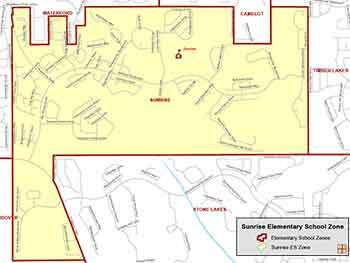 Students of Sunrise Elementary reside within the 32828 zip code. Sunrise Elementary School opened in August 1997 with an approximate enrollment of 535 students in grades Pre-K through fifth grade in our then completed new building. By the end of the 1998-99 school year, our enrollment had grown to 900 students with 5 portable classrooms. On April 3, 2000, we had an enrollment of 1,199 students with 17 portable classrooms. For the 2000-01 school year, we had an enrollment of 1,471 students, 43 portables, and 132 faculty/staff members. After School Programs: OCPS Extended Day Enrichment Program. The Extended Day Enrichment Program offers supervision and a variety of enrichment activities for children in kindergarten through 5th grade. The program is fee-supported by those using its services. Daily activities include homework time, supervised free play, art, drama, crafts, music, dance and organized games.